Tomb of Henry Clay - Lexington, Ky. When most people think of the Lexington Cemetery, they probably immediately think of the Henry Clay monument. And for good reason. It dominates the skyline of this area of Lexington. Though, as a curious aside, it's really tough to see the monument from the cemetery below. It takes up an entire section (Section M) of the cemetery and is surrounded by a dense group of cherry trees. When Henry Clay died in June of 1852, the ensuing ten days of memorials and mourning were national news. The day after he was buried, a group met at the courthouse in Lexington to begin planning "a national monument of historic proportions." They certainly achieved their goal. 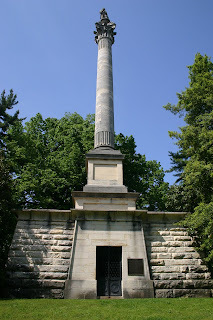 The monument was completed in 1861, but because of the Civil War, Clay's body was not laid to rest there until 1864, when both he and his wife's bodies were placed there. The monument stands on a small hill, and Clay faces east, towards his home - Ashland. Curiously, the monument has had a rather rough time over the years. In 1909, a storm knocked the head off the statute, necessitating a new statue to be built at the cost of $10,000. Then in 1910, the replacement statue was struck by lighting and lost its right hand and leg. The statue was once again repaired for another $10,000. By the time the 1970s rolled around, the statue was a mess, as technically, there was no group responsible for its upkeep. The Cemetery had long ago deeded the land to the Henry Clay Monument Association, a group that no longer existed. To remedy this issue, the orphan monument was vested to the city by the Fayette Circuit Court. The monument saw a complete restoration at the hands of the city in 1976. The city transferred ownership to the Lexington Cemetery in 1999.